You are currently browsing the archive for the Ministry category. On October 20th and 21st, leaders from throughout the district of Yucatan gathered together for a historic event called the Escuela de Multiplicadores (Multipliers’ School). 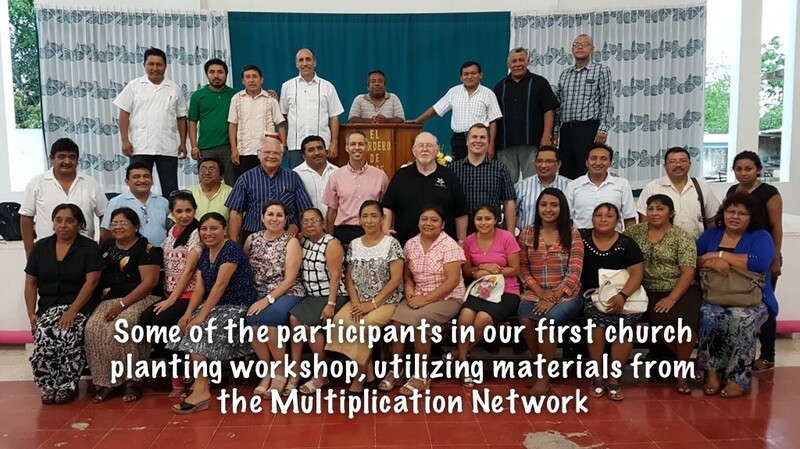 This two-day session was held in preparation for the kickoff of our new church planting cycle, utilizing materials and methods from Red de Multiplicación (RdM). Its goal was to provide the information and the inspiration necessary to set goals for church planting in the two-year period ending in May of 2019 . The event was a historic one, not because of the methods and materials that we were explaining (we had introduced materials from RdM in June of 2016), but because this was the first time that district officials had ever gathered to prioritize and strategize for the planting of churches in this way. The outcome of this first ever effort was more than what we could have hoped for. Arturo Robles, the National Coordinator for RdM joined us from Mexico City for the event. During the sessions, he explained the philosophies and function of RdM and emphasized the belief that a healthy church was a reproducing church. He encouraged each participant to to be involved not simply in the growth of their church but also in its multiplication. It was gratifying to see the vision of the district of Yucatan full of churches becoming clearer to our pastors as they came to under-stand their role in its realization. The time together culminated in a round table discussion led by our regional presbyters in which they challenged our participants to respond to the question ”What should we do?” We asked them to fix a number of churches to be planted as a goal to be reached by 2019. Reflecting back on the past two years, we found that 17 churches had been added to the 225 already in the district, bringing us to the present total of 242. As the numbers from each table were reported, the regions set a future goal to plant 158 churches, a growth of over 900% in comparison with the previous period. The sense of hope and commitment that that number represented brought tears of joy to our eyes. 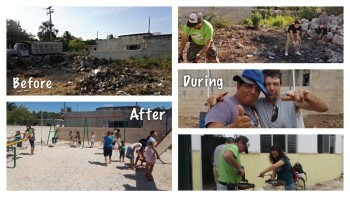 The Escuela de Multiplicadores was indeed a breakthrough for our church planting efforts, something we celebrate. We understand, however, that the work is still ahead—in the recruitment of workers and the mentors that will guide and encourage them. That is the focus of this month of November. Will you pray that many will answer the call? Arturo Robles, National Coordinator of Red de Multiplicación trains district leaders during the Escuela de Multiplicadores (large). Regional Presbyter Juan Hau encourages participants from the western region in the goal planning session (top). Regional Presbyter Raúl Sánchez takes a moment during discussions in the central region (bottom corner). Dave shares inspiration from Isaiah 6 during the morning devotional (bottom right). This month is a month of some drastic change, but instead of writing about it, I’ve recorded a short video to fill you in on all that’s going on. Click the play button above to take a look. The missionary task is two-fold. Primarily, it involves incarnating into the host culture, which includes partnering with the national church to spread the message of the gospel and discipling those who believe, but there is another part of the equation. Without the engagement of those who send, without inspiration to participate in the Great Commission in a practical way, it won’t be long before the missionary must return for lack of support. Here in Mexico, the reduced costs of travel make it easier to bring these two worlds together, but this presents another difficulty—how to blend them. How do we utilize external support without harming the indigenous church? How can we insure a positive experience for those who come while producing a lasting effect for those who remain? Such a balance requires a thorough understanding of the situation on the ground as well as flexibility on the part of those who come to minister. Fortunately, our partnership with church planters like Roberto Ortega, Josué Díaz, and Yónatan Segura provide that necessary insight into the local situation, while teams, such as our most recent from supporting church Chapel Springs of Bristow, VA, adapt to meet the immediate physical and spiritual needs our national partners express. 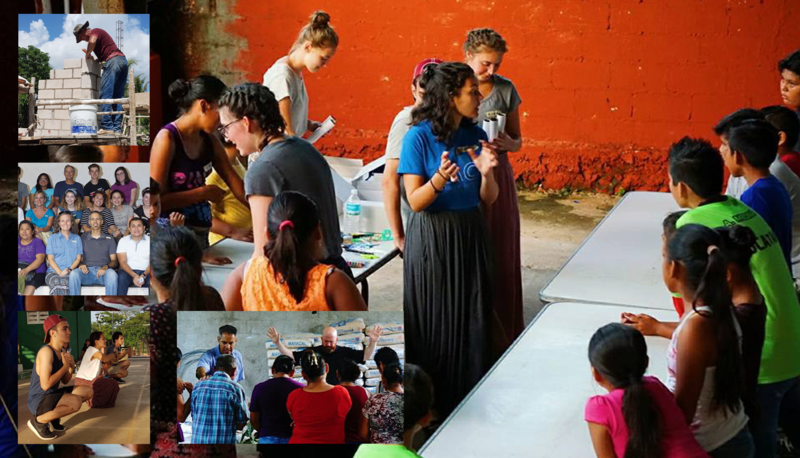 This past week, then, it was a joy to see this team of 19 youth and adults link arms with our Mexican brothers and sisters to make an impact in Kiní, Dzemul, and Motul, Yucatán. The trip began with a powerful welcome service, one in which a former spiritist couple committed their lives to Christ. 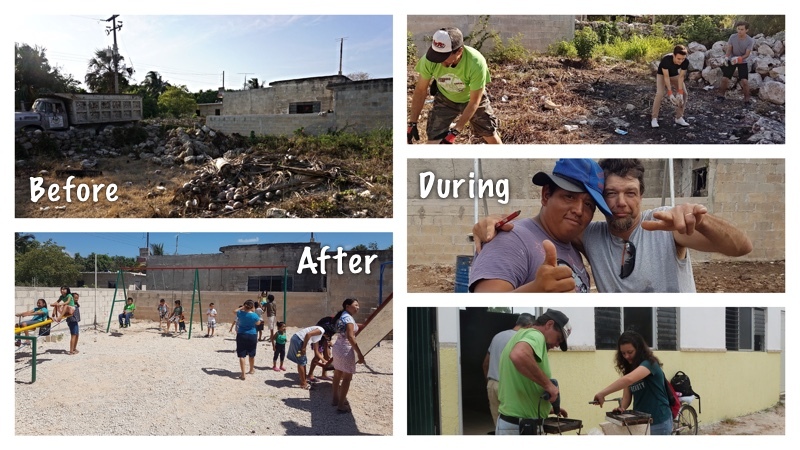 This was followed by a week of construction on the church parsonage and bathrooms in Kiní in the mornings and Vacation Bible School ministry and sports in the evening in all three locations. The week was not without its difficulties, heat and sickness among them, but, having worked together, a church building is nearer to completion in Kiní, a children’s ministry has begun in Dzemul, and a fledgling church plant has enjoyed increased public awareness in Motul. For this synergy in missions, we’re thankful. Rebekah gives explanation during VBS craft time in Dzemul (large). David Bontrager gives shape to the parsonage in Kiní (top). Mexican/American partnership in outreach to Motul (middle). Bittersweet: The last missions team for our trio (bottom left). Dave and Kevin minister in the midst of construction material (bottom right). March was a hectic month to say the least; playing host to two teams and a state-side trip had me wondering if I was coming or going. Add to that a seasonal sinus infection and I was primed for a personal pity party. At the lowest point, alone, on the road, congested and unable to sleep, I’m sure the thought “What difference does all this make, anyway?” had crossed my mind if not once then several times. That’s not to say that good wasn’t being done. A roof was raised in Kiní, giving a growing congregation a place to meet, shaded from the blazing sun and protected from the rains that are soon to come. A church building was started in Tekax, breaking ground on a vision to reach that city of over 25,000 with its 90+ surrounding communities. Youth and adults were challenged to leave their comfort zone and join in God’s mission to reach the nations. But in the same way that prophets have been known to battle with self doubt, so this missionary was feeling the psychological burden of being over-extended, though his wounds may well have been self-inflicted. A “chance” meeting on a Wednesday afternoon, then, was just what the doctor, or the psychologist ordered. A man by the name of Luis stopped by the building site in Tekax. He had met one of the team members from the church the evening before on the square and had wanted to thank him for taking the time to talk with him. While he was chatting with the pastor and the team member, he suddenly stopped and took a hard look at me, trying to place me as I took off my sunglasses. “Did you lead a campaign here in Tekax eight years ago?,” he asked me. All of a sudden, the hectic schedule, the physical exhaustion, perhaps even the sinus infection were but a distant memory. What difference does it make? For Luis, eight years ago, it made all the difference in the world. What could be better than kicking off the New Year, spending 3 days discovering how you can fit into God’s plan to save the world? 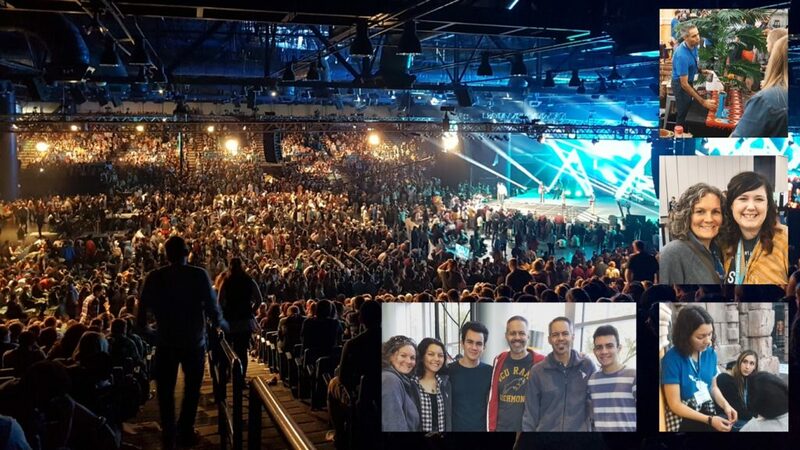 “Nothing,” answered the 6,153 college students that attended the 4th World Missions Summit (TWMS4) from January 4-6 in Houston, Texas’ George R. Brown Arena. TWMS4 is a joint venture between the Assemblies of God college ministry, Chi Alpha, and Assemblies of God World Missions to engage the next generation in global service. During the event, the attendees are challenged to “give a year and pray about a lifetime.” When the event ended, over 1,800 students had responded affirmatively to that challenge. As a family, we were invited to participate in the conference where we had the opportunity to connect with these students during four “Meals with a Missionary” and in the Latin America Caribbean exhibit and experience areas, sharing our calling and ministry and helping them to determine their next step in responding to God’s heart for the nations. While the overall response was amazing, the highlight for us was the interactions that we had with the students on a one-on-one basis. Whether it was helping Liam* connect the dots from his past life of dealing drugs in the rural Midwest to serving God on a foreign field or praying for Hunter to receive the Baptism of the Holy Spirit, with each conversation we were encouraged by this generation’s passion to be a part of something bigger than themselves and humbled by the opportunity to direct them in living out that passion. Of course, confusing old and new friends alike by having my twin brother Mike at the event was pretty fun too! All in all, we return to Mexico blessed and revitalized for having been a part of TWMS4. How is God leading you in the New Year? How do you see yourself engaging in missions in 2017? Over 1800 students respond to the call to give a year (large). Dave: making coffee and missions connections (top). Kelly: stopping to visit with Lanley from Cape Girardeau (middle). Rebekah: braiding hair in the LAC exhibit (bottom). The whole Godzwa Summit crew (bottom middle). When we think of teams, our mind naturally turns to the world of sports and those teams that dominate the game that they play. Being a baseball fan, my mind naturally goes back to the Yankees of 96-2001. Their string of four World Series wins in five years made it look easy, but the remarkable character of that team was the lack of superstars at any position. Still, what they lacked in individual statistics, they made up for in cohesion. They found ways to win. As we look forward to a Yucatan peninsula full of churches, we understand that we cannot fall into the trap of searching for superstars. As the great teams have proved, talent alone doesn’t win championships, it takes teamwork. That is why we’re working to create just the sort of team that will enable us to advance to our goal. We’re pleased, then, to report that what began as an ad hoc committee of three in late April to introduce church planting concepts has now blossomed into a network of ministry partners in strategic positions to promote and administrate what we believe will become a church planting movement. 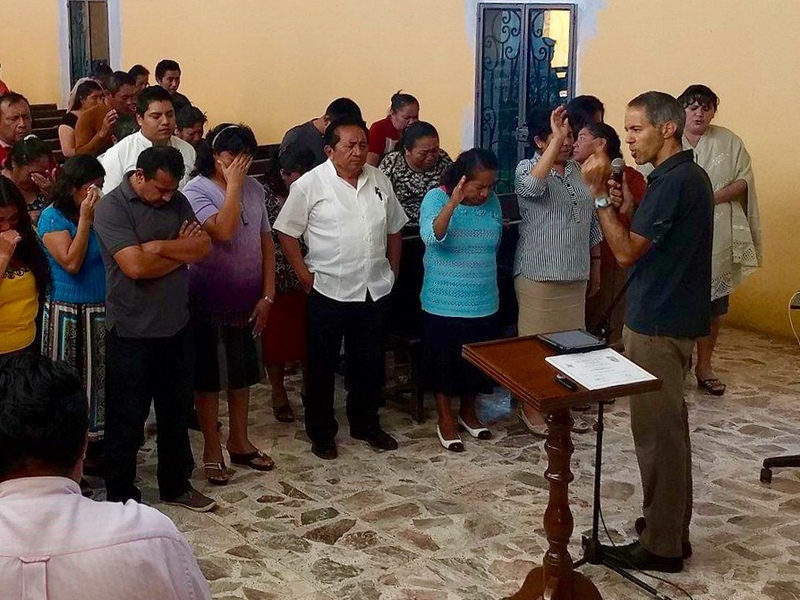 Our first strategic partnership was forged with the evangelism department in the district of Yucatan. The president of the department, Ricardo Rodriguez, has not only opened up his pre-approved dates to hold our events, but he also brings a passion for souls and a commitment to prayer to our church planting team. 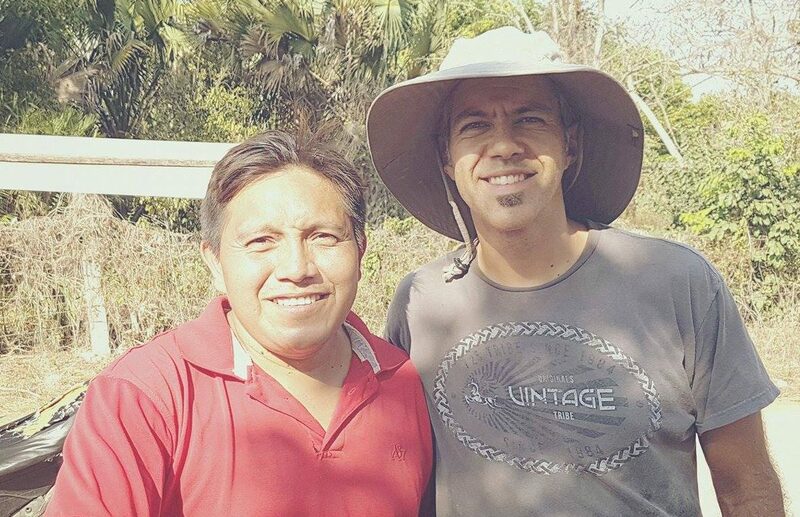 Another key player has been found in our long-time friend, and now director of the district missions department, Silverio Blanco. He has lent his vast knowledge of the district and his more that 40 years of ministerial experience to the work. These men join Felipe Sabido, Alfonso Vera, Abel Can and a group of five regional coordinators as together we work to steer this church planting vision through its various stages from inspiration to implementation. Of course, what characterizes any champion is one thing: production. For us, production means new churches planted. That, in the end, will determine if these key elements have combined to form a truly great team. Will you pray with us that we might see this production? A major milestone comes October 20-22 as we invite potential workers to take part in our first church planters’ retreat of the program. For an anointing on the location and the program. For the clear and powerful presentation of the concepts. For the right people in attendance. When you think of a church planter, what comes to mind? A Bible School graduate? An associate pastor? A missionary? In May, I found out that, at least in Latin America, the church planter is probably none of these. Attending the Assemblies of God Church Planting Roundtable in Quito, Ecuador, I was confronted with the staggering statistic that up to 90% of church planters are laity. That’s right. They don’t have advanced theological degrees or ministerial credentials. But they do have a call. This past week, I met one of those church planters. His name is Miguel Avilés. Prior to his involvement in the ministry he worked as a police officer. Still, at the age of 58, when many are thinking of retirement, God was moving on his heart, and even though he was so nervous he couldn’t finish his first sermon, he remained faithful to the call he had received to preach. That was 16 years ago. Since that time, he’s seen God direct him from church member to itinerant preacher to, four years later, pastor of Tierra Santa, a church that he began together with his wife, Alicia. Ministering with them on Sunday, I got a chance to hear the church’s twelve year history—one of faith, perseverance, and a bit of trial and error. As church planters, they’d succeeded, but it’s easy to see how many like them fail—because of isolation. Although spiritually prepared for the battle, Miguel and Alicia have faced struggles that they hadn’t anticipated. They admitted that they didn’t have the toolset to face many of those challenges as they did, alone. But what if they didn’t have to go alone? What if they had the support of a modular system of training readily applicable to the stage of their plant? What if they were grouped together in a cohort of church planters, each one pulling for and praying for the other? What if they were paired with someone who could assess their progress, make suggestions, and help them deal with the myriad of problems along the way? 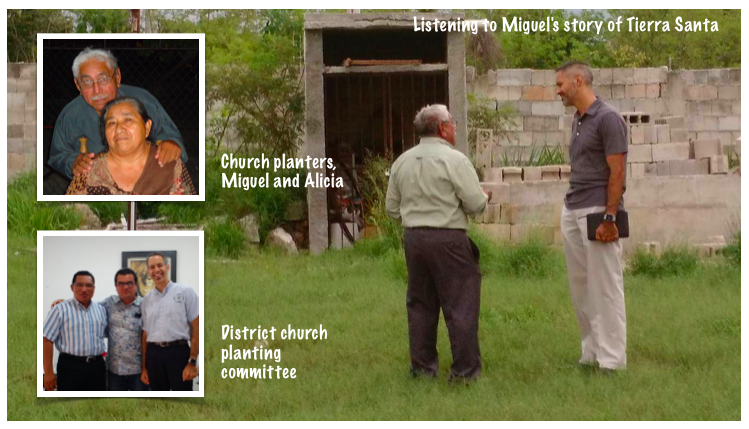 What could that mean for church planters like Miguel and Alicia? What could that mean for the Yucatán? That is what we are asking ourselves as we move forward from our June workshop “Sembremos Iglesias Saludables“. A pilot project for church planters starts September 17, which is part of a permanent church planting program. It’s goal: to keep people like Miguel and Alicia from having to go it alone. Be in prayer with us as together we take this step of faith to equip the 90%! Have you ever had a great idea that came to you before others were able or willing to take it seriously? Maybe you had shared it with a few individuals without effect. Perhaps you even attempted to put it into practice, but you lacked the support to be able to see it through. Let me encourage you to not give up, because, if this past weekend was any indication, persistence pays off. Since 2012, when I stumbled upon church planting material from Red de Multiplication (Multiplication Network) in preparation for a class, I had the feeling that they were on to something that could revolutionize the way we do evangelism and outreach. Their program emphasizes people over property and discipleship over building construction. It is a low cost, high impact plan that has since been adopted by evangelical denominations world-wide with tremendous success. During two days, June 9 and 10, our District Superintendent, Magaly Balam, opened her church to us as we hosted fellow missionaries Jerry Brown and Peter Breit, representatives for the Commission of Evangelism and Church Planting (CEPI), for the first session of training. From my opening devotional, underlining our vision, through the step by step outline of the process, the participants listened with interest. As Jerry, Peter, and I went through the material, it was clear that it was striking a chord, identifying areas of weakness in our traditional models while providing solutions to overcome them. At the conclusion of our time together, there was a consensus among the attendees that they had been given a valuable tool, a tool that they wanted to put to use. What was even more satisfying was what went on behind the scenes. 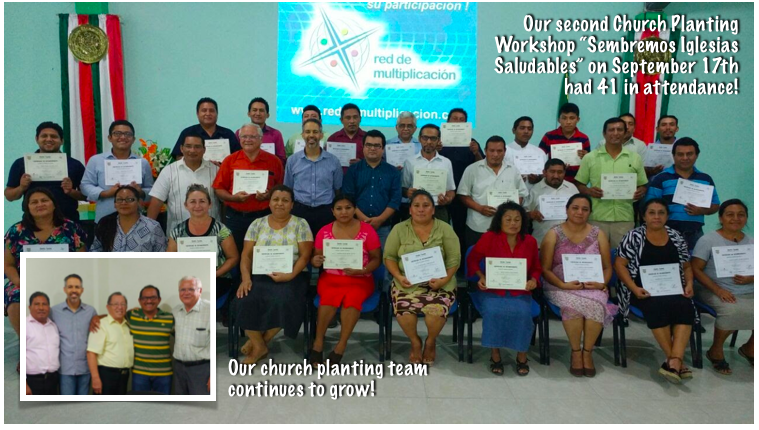 Working together with my organizing team, District Secretary, Alfonso Vera, and Pastor, Felipe Sabido, we were able to create a tentative structure and invite key leaders to collaborate with us to guarantee that the church planting process would move forward. All of those who were asked heartily accepted their role. Of course, the work has just begun. There is much to do to ensure that we move from this step of vision on to training and finally implementation, but the fact remains that, after 4 long years of waiting we have finally begun. Persistence pays off! Three thousand miles apart, two different dreams began to take shape. For Bruce Kunkle in Cambridge Springs, PA, it was a dream of providing a safe place for kids to have fun on church grounds, a kind of a first step for those who would later hear about, and ultimately accept the love of Jesus as experienced through the teachings and actions of a caring congregation. For the people of the church El Mesias in Chicxulub Pueblo and their pastor, Isidro Dzul, it was to let the the 200+ kids that they minister to during their Vacation Bible School have a place to blow off some steam between lessons. On May 8th, those two dreams converged and Parque El Mesías was born. The work began months earlier as conceptual drawings were made and materials selected. All of this was definitely out of my comfort zone. There were trips to local parks, sessions with handymen to brainstorm, and visits to several local hardware and building supply stores. Finally, the decisions were made and the supplies purchased. The work began on that Mother’s Day Sunday, May 8th. When we arrived, we were a bit overwhelmed by how much work there was to be done to prep the site. There were rocks to clear, there was ground to be leveled, and there were holes to be dug. Still, our spirits lifted when we saw the response of the church, a whole team of men and women arrived that morning and worked through the day with us to help make progress. This same spirit of collaboration held strong throughout the week as the ladies of the church took turn to provide meals and men either took off work or came by afterwords to help with the hard labor. And hard labor it was, as the sun bore down and temperatures soared to 104 degrees! Still, the work went on: digging sawing, welding, moving, leveling until the park began to take shape. Bruce, even though he was hardly used to the sweltering temperatures, worked long days to make sure the work would be finished. Of course, the thankfulness of the congregation made all of the difficulty more than worth it. On Friday night, the last evening that Bruce would be there, the children surprised us with a special farewell service. Some had made signs for the event, others gave gifts and cards, everyone had a word to say to those who had helped make their dream of a park come true. Never had I seen such an outpouring of gratitude in my ten years as a missionary in Mexico. Are we going to be dedicating ourselves to building parks from now on? Hardly. 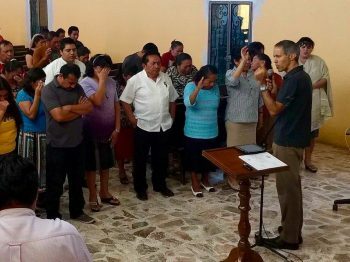 Still, I wouldn’t say that this project was a distraction from our vision of the Yucatan Peninsula full of churches, diverse in class, status, education, and language but united in their love for the Lord and for one another. As I reflect upon our time in Chicxulub Pueblo, I would venture to say that, for that week, we became that vision as men and women, adults and children, Mexicans and Americans worked together with a common purpose, transforming a barren field into a welcoming park, bustling with activity. All of that and the opportunity to make dreams come true? I’ll say yes to that any day of the week. Take a look for yourself and see if you’re not convinced as well.